The goal of every lawn owner is to keep it looking clean, green and in good health. Usually, this requires a good deal of effort if you are doing it yourself or using a lawn care service in your area to handle it. The fall-out of this desire to keep lawns looking great is the abuse of lawn care practices that might affect the environment negatively. The use of inorganic fertilizers, chemical pesticides and other synthetic substances on the lawn are mostly not eco-friendly even though they may be effective at delivering the results you need. In essence, such practices usually come with an extra cost that you may not see immediately. Aeration improves your soil for lawn grass’s benefit. Let’s look at it this way, as time goes by, your land becomes compacted, and it becomes increasingly difficult for nutrients and other matter to permeate your soil adequately. This development usually happens when there has been a lot of foot traffic in the soil all year long. For example, the land is said to be undergoing compaction if it forms balls when gripped in the palm. An eco-friendly tip that provides a solution to lawn soils in this condition is aeration. It is done through the use of aeration equipment to puncture holes in the land to loosen it up. Alternatively, gardening forks or pitchforks can be used to turn up soil if you have a small lawn yard. Aeration, when done right improves the growth of your grasses. 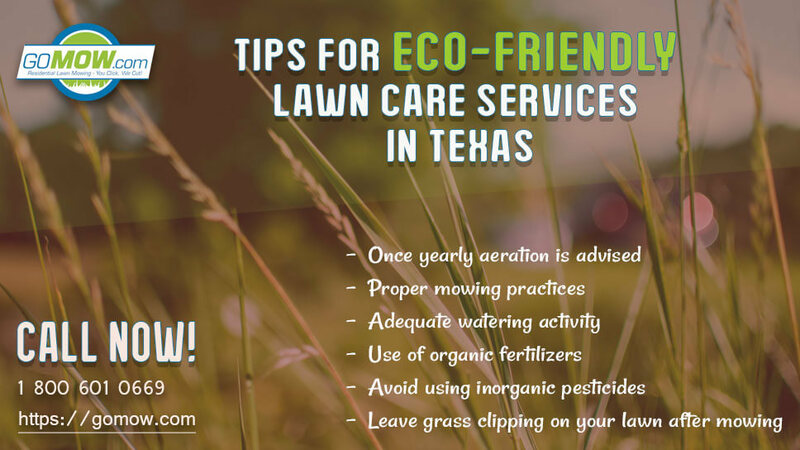 Another tip to look out for in an eco-friendly lawn care service in Texas is their mowing practices. It is essential to check this out for yourself before maintaining a long-term relationship with a lawn mowing service. Mower blades should always be sharp to ensure that cutting is done cleanly without ripping your grass. Mowing should be done at the right height, usually 1/3 of the height of your lawn. Cutting your lawn grass too low is not exactly friendly to the environment as it over-exposes your lawn to the elements which could lead to drying up or weed infestation. 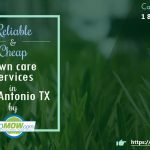 Consider using GoMow lawn care service in Austin to give your lawn the best care. Like all living things, your grasses need water to live healthily and carry out their metabolic activities. When choosing a lawn care service in Texas, it is important to discuss their watering plans for your lawn. Lawn grass needs just an inch of water per week to be in the best health condition with deep growing roots and improved resistance against droughts. 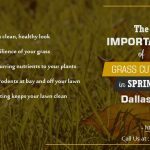 It is also advisable for your chosen local lawn service Dallas to water your lawn in the mornings when the sun’s heat is still minimal to reduce the possibility of evaporation. Loss of water due to evaporation is high in the afternoon compared to in the early mornings. If your lawn grass requires nutrient fortification, the best option to go for is organic fertilizers. This type of fertilizer is rich, eco-friendly and highly nutritious to your lawn grass. Organic fertilizers are rich in nitrogen and carbon compounds which are necessary for plant development. Also, organic fertilizers break down entirely in the soil adding nutrients to our grass almost immediately. When choosing a lawn care service, their fertilizer application service will tell you if they are an eco-friendly service or not. Just like inorganic fertilizers, synthetic fertilizers usually have toxic compounds in them. These pesticides cause general problems after they are used on your lawn. They can cause health problems for your kids or pets playing in the lawn. Water running off such lawns can enter into water bodies to cause complications for fishes and other water organisms. Contamination is also highly likely if inorganic pesticides are used indiscriminately. It is best to avoid this type of pesticide as an eco-friendly tip. If there is a need to use inorganic pesticides, ensure that a reliable lawn care service with experience handles the application for you. Some organic pesticides are quite effective against weeds, insects, and rodents. Examples include corn gluten, white vinegar, soap suds, and diatomaceous earth which are super effective against pests. For guidance on how best to apply pesticides in an eco-friendly way, your local lawn care service should be most helpful in getting you started. An eco-friendly tip that your preferred lawn mowing service should consider is leaving your grass clippings on your lawn grass after mowing. These mown grasses are naturally-rich in nitrogen and when it decomposes it returns nutrients to your lawn completely. Leaving grass clippings on your lawn grass not only improves your lawn yard but also provides an avenue to dispose of cut grasses. 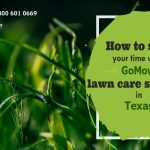 We believe these eco-friendly tips when put into by action by your lawn care service in Texas will have your lawn looking natural, lush-green and healthy. At GoMow Lawn Mowing Services Texas, we are committed to making this possible. Contact us right away & Click below to get started today!